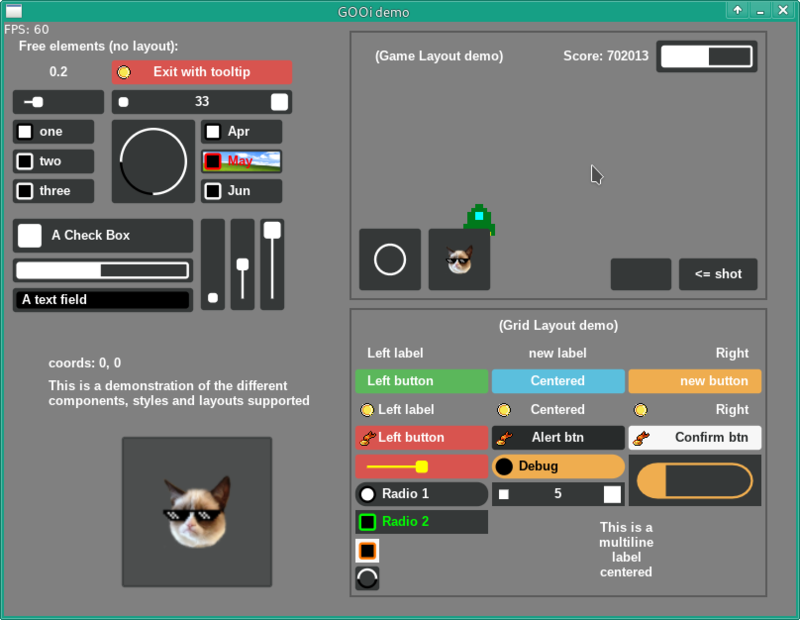 Hi guys, This is a GUI Library I'm making named GOOi. Please feel free to take a look. Last edited by alberto_lara on Mon Apr 22, 2019 6:26 pm, edited 65 times in total. This is great! My favorite thing it that the gui seems to properly scale on changes in pixel density. Hey, thanks for your comments, to I~=Spam, the scale is not an automated thing, I'm just getting bounds which will be sort of the same independently of the window resolution , though, I'm thinking on adding a viewport coordinates "mode" for the gui, so you can say "I want this button on the half width" by putting just 0.5 on the component's X value. I'm also thinking on adding aspect-ratio support for this... not sure if that can be useful but I'm open to suggestions. To norubal, excuse my ignorance but I'm not sure what you mean (more like I don't know what is it) by multilingual, I'm googling that. I just put the .love file instead of the link to MEGA... you can call me stupid, I didn't know how to do it. The .love file it's the same as the link, but I have another version of this in the office, the multitouch support seems to be going well, after doing that, I'll put the viewport thing, upload another demo(s) and let you know anything as far as I have a chance. I hope this library can support chars like ñ, so I can print something like "Здравствуите". norubal wrote: I hope this library can support chars like ñ, so I can print something like "Здравствуите". Just updated the post, you can hug me now! If you use love.graphics.polygon instead of beziers, you can get the shapes to look almost the same, with less calculation. I found they look quite good with just a few points. Of course, you'll need to do some more math yourself, to place the points. Simply generate the list of points every time you create a new button (or change its size), then call love.graphics.polygon on that list when drawing the button. Bezier curves are really cool, but they seem very overkill for a GUI. norubal wrote: 사랑합니다! I LOVE YOU! To Germanunkol, you're totally right, I almost forget the polygons, let me try that!